Preparing for court presentation, 1847. 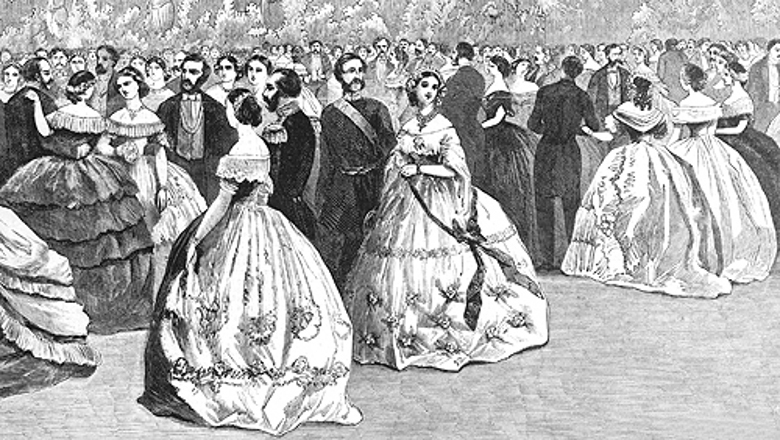 During the Regency and into the Victorian era, the London social season was particularly busy from April to the end of June, but events were held throughout the winter, starting when Parliament returned in late January and included military reviews, dinner parties, and charity events, and went on to the end of July. Débutante (French for female beginner) balls were a highlight, hosted at the grand houses of the aristocracy. Lord Byron referred to these galas as marriage marts, because it was the best venue for young ladies to encounter possible suitors. There were very few upper-class public social venues in London open to both sexes. An exception was Almack’s Assembly Rooms, which opened in 1765, and admitted both men and women. Other popular meeting venues included the parks and gardens, in particular Hyde, Green, and St. James’s, where nice Saturday afternoons drew enormous crowds. Once wealthy young ladies were “out” they were expected to “ride the parks” and show off their fine statuesque figures, while mounted on magnificent expensive horses, accompanied by a parent, a brother, or a groom. By the end of June, London was so hot and smelly, everyone with a country estate would flee, but the coming sewer systems, and grand new neighbourhoods with improved wash rooms, would make the capital all the more bearable by the late 1860s. 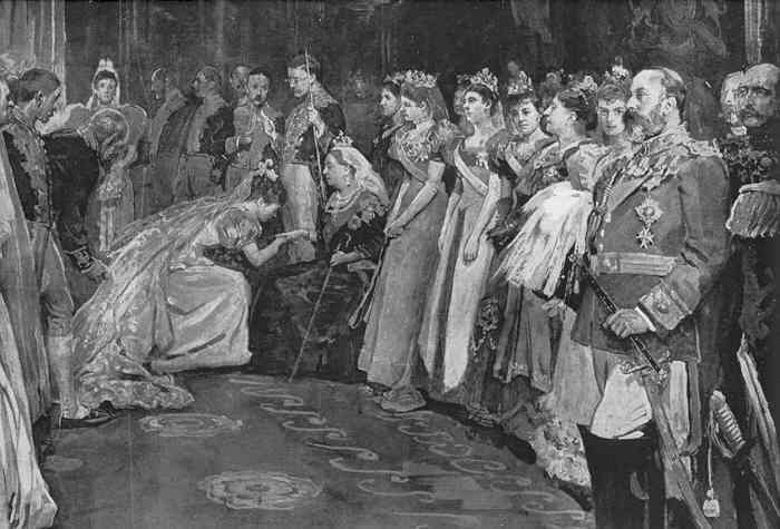 Young Queen Victoria happily embraced the gaiety of her uncles George’s and William’s reigns, but grew more prim and proper as she had children, then stricter upon the death of Prince Albert. She remained in mourning for the rest of her life, and demanded greater moral standards with each passing decade. Court presentation in the Queen’s drawing room, St. James’s Palace, 1843, by Sir J. Gilbert. While it is a formal ceremony, it appears quite casual compared to what evolved during the later decades of the 19th century. 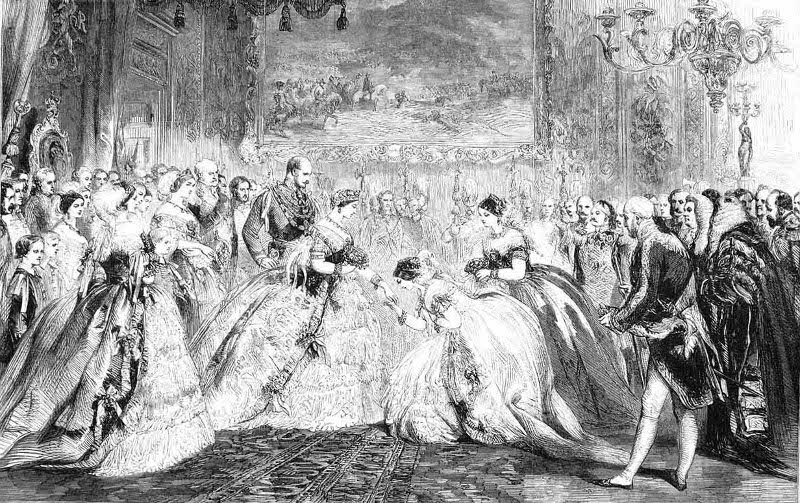 The presentation of débutantes at court during the early period of Victoria’s reign, known as the “coming out” ceremony, coincided with the start of the London high social season (just after Easter). Two or three days would be set aside for the presentations, about one to two hundred girls each day, queueing up in their carriages outside St. James’s Palace (later Buckingham Palace), carrying bouquets and dressed rather like it was their wedding day. For much of the 1800s wedding dresses were actually simpler than court gowns, brides often selecting something that could be worn again, even dark coloured travelling suits acceptable. 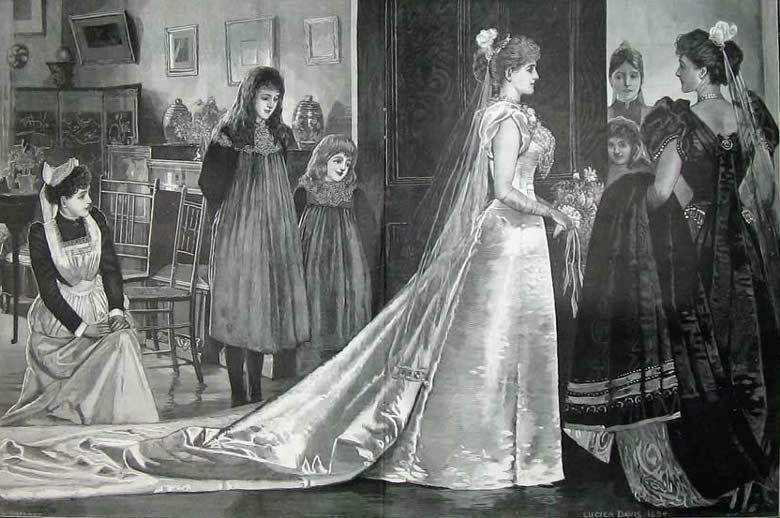 Later in the century some women had their presentation outfit altered for their nuptials, and the modern wedding dress is probably a direct descendant of the white silk débutante court gown. Applications for young ladies inclusion in the coming out ceremony were required to be made by ladies who themselves had been presented to the sovereign when they were young, often the mother, grandmother, step-mother, or someone else known by the family; the higher in aristocratic rank the better. Married and older ladies, but no one who’d been divorced or had a previous marriage annulled, would also be presented at court as their social status changed following the same protocols, but not as débutantes, then they could attend court balls or functions. An elegant ball. Judging from the gowns, and facial hair of the men, this is from the early to mid 1850s. Note: While it was expected that débutantes of the aristocracy (including knights and baronets) would be presented at court during their coming out season, only daughters of the clergy, of military and naval officers, of physicians, and of barristers, were also eligible for this honour. However, there were numerous other girls coming out in any given year, some fabulously wealthy, who attended balls, parties, teas, &c, but weren’t presented to the Queen and didn’t attend court functions. If they married well, and their husband met the criteria, then they could be presented, but not as part of the débutante ceremonies. 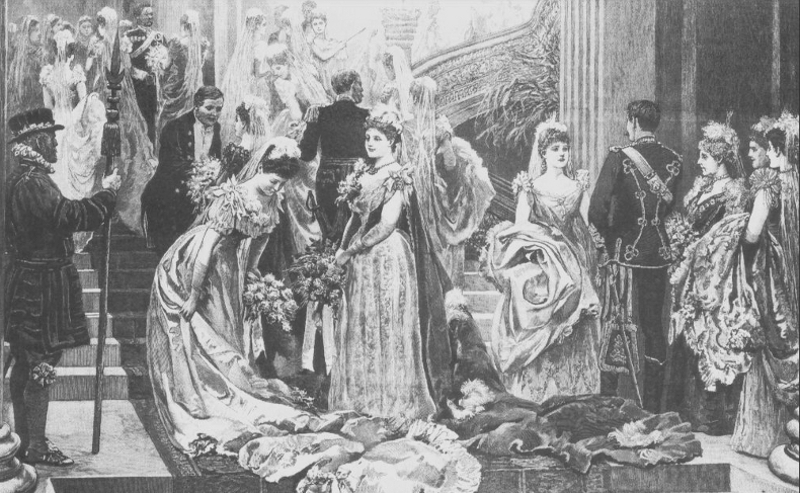 The Queen’s Drawingroom, ceremony of presentations, 31 March 1860, The Illustrated London News. This is still quite informal. Easter was on the 8th of April in 1860, so for some reason presentations were early on this year. Only a handful of girls met all the criteria in any given season. The bachelors and their families understood the impossibly high standards that were set, and many noble gentlemen married common girls, who had not yet been presented at court but carried themselves better. These common girls would have “come out” at smaller balls, or country dances, and relied on their families and friends to make connections and move them up the social strata. A beautiful and talented girl might find a wealthy patroness, perhaps a dowager, to take her to London and show her off. Certainly the noble débutantes would have looked down their noses at these common girls, but also been jealous of them, especially when they landed a brilliant match. Débutantes waiting to be presented. When a young lady was “out” she immediately started receiving invitations to all the events. A popular girl would be highly sought after, and gentlemen would “call” on her. This could be as simple as leaving their card. The men would make themselves available at balls, requesting turns on the dance floor, or invite her father or guardian to visit (hoping she would come with him), a walk (chaperoned), or dinner with each other’s families. These men were known as prospective suitors, and a dating process known as courting would follow. Some girls went through the first season with a fiancé already lined up, often arranged by parents for dynastic or monetary reasons. Courting could go on for years, including many different suitors, or be quite short, followed by a couple months of engagement and marriage. By the late Victorian era courting was expected to last at least six months, and an engagement of at least six months again, giving the couple much longer to contemplate a lifetime together. A mother and perhaps her eldest daughter ready for the presentation, little sisters and maids look on proudly. This would be late Victorian, when the nine foot train was a requirement. As the 19th century wore on, the London social season shifted, traditionally beginning after Easter and ending with the “Glorious Twelfth” (12 August), the start of the shooting season for red grouse. This date had been established long before in 1831 with the Game Act, and specified the opening of various hunting seasons. The wealthy (whether peerage or gentry) all wanted to be back in their country manors for shooting and hunt parties, which served as another type of social season. Many a girl who didn’t shine on the dance floor, won hearts with her riding skills chasing a fox. Then there was always church, where a girl could sing angelically while standing advantageously, dappled in stained glass sunlight. By the late Victorian era the society rules had grown far more strict, including codes of conduct, books of etiquette, and further crushing standards for young ladies. The “coming out” process was only a small part of it all, and what had started as a simple meeting of court circle mothers and their eligible daughters saying hello to Queen Charlotte (wife of George III) ballooned into an expensive nerve-racking spectacle. Court presentations were suspended during WWI and WWII, then Queen Elizabeth II did away with the ceremony in 1958. When the announcement was made, 1400 girls were presented over three days, a great deal of them pulled out of boarding school to attend. A coming out ceremony in 1893. Peeresses received a kiss on the forehead, everyone else kissed the Queen’s hand. Some people have written a débutante had to be eighteen, but there never seemed to be a rule put in place. During the Regency and into the Victorian era the girls were as young as twelve, but it was a lot less formal during the early 1800s. The Queen’s eldest daughter was engaged at fourteen, married at seventeen, in 1855. 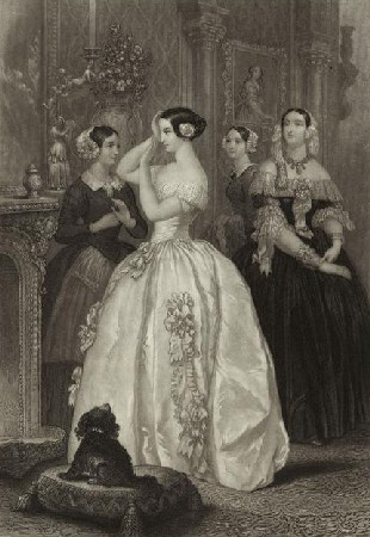 (Kate Tattersall, nee Beaufort, was presented at fifteen, April 1849, and married at sixteen.) By the 1890s and into the Edwardian era a young lady reaching the age of eighteen of any particular year could have their “coming out” presentation. This had more to do with the evolution of the education system than anything else, with a complete modern schooling taking more time, so the girls getting older. 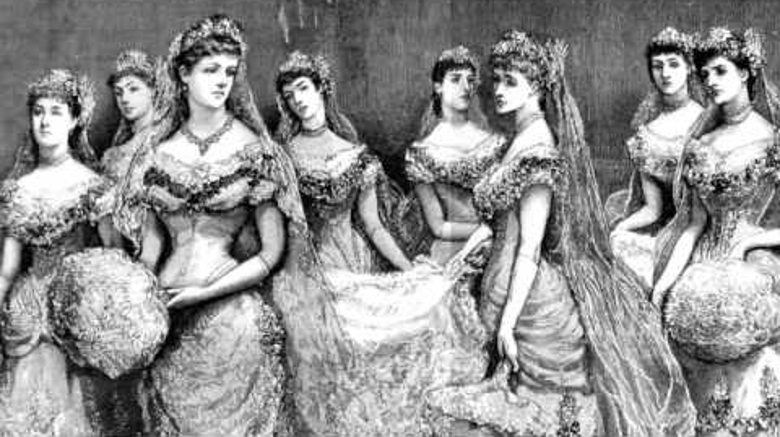 To read many articles from various sources, check out Courting in the Victorian Era. The following list is just a smattering of examples gleaned quickly from the records of the Regency through to early Victorian eras. I could also quote from literature written during the times, but decided to stick with historical facts to provide an idea of the ages of aristocratic and gentry brides. Lady Louisa Thynne (1808 to 1857), daughter of the 2nd Marquess of Bath, married Henry Lascelles, 3rd Earl of Herewood in 1823, when she was aged 15. She had thirteen children. Lady Blanche Georgiana Howard (1812 to 1840), daughter of the 6th Earl of Carlisle, married William Cavendish, 7th Duke of Devonshire in 1829, when she was aged 17. She had five children. Juliana Whitbread (1825 to 1870), granddaughter of the 21st Baron Dacre, married Thomas Coke, 2nd Earl of Leicester in 1843, when she was aged 18. She had nine children. Lady Agnes Georgiana Elizabeth Hay (1829 to 1909), daughter of the 18th Earl of Errol, married James Duff, 5th Earl Fife in March 1846, when she was aged 16. She had six children. Lady Constance Henrietta (1831 to 1878), daughter of the 2nd Marquess of Anglesey, married George Finch-Hatton, 11th Earl of Winchilsea in 1846, when she was aged 15. She had four children. Henrietta Anne Theodosia Vyner (1833 to 1907), daughter of Henry Vyner, married George Frederick Samuel Robinson, 1st Marquess of Ripon on 8 April 1851, when she was aged 17. She had two children. Lady Constance Gertrude Leveson-Gower (1834 to 1880), daughter of the 2nd Duke of Sutherland, married Hugh Lupus Grosvenor, 1st Duke of Westminster on 28 April 1852, when she was aged 17. She had eight children. Lady Katherine Elizabeth Hamilton (1840 to 1874), daughter of the 1st Duke of Abercorn, married William Henry Edgcumbe, 4th Earl of Mount Edgcumbe on 26 October 1858, when she was aged 18. She had four children. Lady Blanche Emma Lascelles (1837 to 1863), daughter of the 3rd Earl of Harewood, married Henry Bentinck Boyle, 5th Earl of Shannon on 12 July 1859, when she was aged 17. She had three children. Lady Evelyn Elizabeth Gordon (1846 to 1921), daughter of the 10th Marquess of Huntly, married Gilbert Heathcote-Drummond-Willoughby, 1st Earl of Ancaster on 14 July 1863, when she was aged 17. She had five children. These girls were well placed members of the aristocracy and had likely been presented in the April a year or two previous to their marriage, but not necessarily. Based on what I’ve read, during the early Victorian era, the average age of an upper-class virgin bride was 19 years old; by the late Victorian era 21 years of age. Fascinating info. I remember debutantes’ balls were very fashionable in Montreal when I was a teenager. 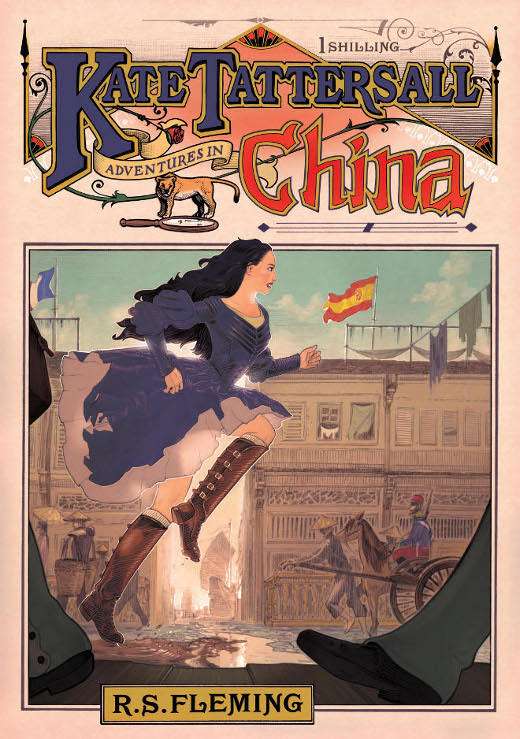 I am doing research for a novel for children set in Victorian England 1855. I was delighted to discover your blog and have bookmarked it. This is an amazing article on debutante balls! Thank you so much for writing it – I’ve learnt a lot! Many thanks for the blog. Where can I find information about why this tradition was abolished along with the “Season”? @ Dhanushi, try searching “the last débutantes” and you should find quite a bit. It was the hard times in England after WWII that brought it to an end. The masses didn’t like seeing the wealthy parading themselves, and some unscrupulous well-born ladies started charging large fees to bring out girls, so the “spirit” of the event was lost. I am so shocked at how much has changed in the past century (and a bit), WOW! Learning about the development of the wedding dress was also fascinating! Really enjoyed your article. Loved the pictures. Your writing flows like a river! Thank You! Hi! Thanks so much for the information. I hadn’t come across the note before that only the aristocracy would have been presented to the Queen. This is an amazing article! I really like this and thank you so much for writing it – I’ve learnt a lot about debutantes’ balls. Very interesting article and I just love the pictures showing those grand dresses! I am a historian doing some research, and I did find this helpful! However, I want to suggest clarification about how you present the issue of life expectancy in this era. Leaving out cases of infant mortality is a good start to getting a better understanding of life length, but the way that averages work skews the statistics in a way that doesn’t always match well with the historic realities. Most importantly, infant mortality went hand-in-hand with a high rate of maternal deaths during or shortly after childbirth. The life expectancy averages suggesting that most people died before reaching their 50’s owes more to mathematical calculations than actual life expectancy patterns, which are more complicated. Women who did not experience pregnancy/survived childbearing years could reasonably expect to live into their 60’s and even 70’s. Interestingly, the modern trend of women living longer than men is reflected in the historic record once the issue of childbirth is factored out; in other words, the same gender advantage that we see in life expectancy trends now was shared by past generations of women once they reached the end of their childbearing years. Unfortunately, many historians and other experts did not make gender distinctions part of their equations, meaning high rates of childbirth deaths for mothers also skewed the average life expectancy figures for men. There are additional factors affecting the figures for historic male life expectancies, with modern trends again visible in the patterns from the past, particularly those involving violent or accident-related deaths. Those are and were the leading causes cutting short the lives of younger men, but the lack of today’s quality medical care created higher numbers of fatalities from such incidents. So, both men and women in Tattersall’s era certainly faced greater challenges to living long and well, but it was nevertheless quite common for people to survive into their 60’s and 70’s, with those unfortunates who did not live long and prosper generally dying younger than the 40-something years in life-length averages. Thanks for your input, Cathy. Stats can always be skewed to support any argument. I appreciate your time to include this information. In Victorian society, most women not bearing children were generally considered an anomaly, and a failure. Of course, childbirth was the leading cause of female death, just as it is in undeveloped countries today. As I noted in the article, people lived to their 80s and 90s. Could you recommend me of etiquette rules of society of young lady? Anna, please send me a note through the contact page and I will provide some information. I tried already, but you must have entered your email address incorrectly. It is from 1849, London. Send me a note through the contact page if you would like more information. Thanks for the information you provided. I have studied the Season for a while now, but you were able to provide new information I did not know about. Thank you for this article. I’m becoming increasingly interested in reading about this era and am glad to have found this site. Thank you, for the information! Thanks for the info on less aristocratic debutantes. I am writing a novel which includes two gentry girls having a season in London before returning home to marry in the country. Interesting that a girl could still ‘come out’ without the necessity of a court presentation. This site is an incredible resource. The amount of information I am reading is astounding! After I read “Cruel Streets,” I went to the very beginning of the blog in Feb of 2012 and started slowly going forward. I am absolutely fascinated by this era. In fact last evening I watched a documentary on George Westinghouse, the US industrialist. Be it the American side or the British side, it is a fascinating time to study. Good info… Could you elaborate… After a lady was presented at court to the Queen did her family then host a type of ball in celebration? Yes, there would be a ball where the debutante would greet guests with her parents. This might be held at the family home, another home, or a rented hall. There were circumstances when several sets of parents with their daughters hosted a ball together. Thank you so much for your efforts in compiling all of this. Hi, what happened to orphan noble woman who wanted to participate in those events? Thank you for providing me with all this information! Hi Grace. Girls would look for a relative or family friend to present her at court, the higher in aristocratic rank the better. Any woman previously presented could make the application to present a debutante who met the criteria. Very informative, definitely picked up some tidbits I did not know. Thank you. I was looking for information on “coming out” and related… in this case specifically how long the preparations for a debut took… in terms of moving the household, etc. I imagine it took a few months at least (gowns to be ordered up, etc.) But of course I could be wrong. Hi Tracy. I think that would depend on the year, and the rank of those involved. There were countless variables.